1. If your hair stands on end, you’re about to be struck by lightning. Fact. If your hair stands on end, you could be in an area where a charge is building before a lightning strike. 2. Lightning only happens where it’s raining. Fiction. Most deaths and injuries from lightning occur as a storm is rapidly approaching or within a half-hour after one has passed. Lightning can strike as far as six miles ahead of or behind the storm, even while the sky overhead is blue. 3. What you wear (sneakers, rubber boots, hairpins, cleats, etc.) can increase or decrease your chances of being struck by lightning. Fiction. Studies indicate that what you wear doesn’t make much difference either way. 4. You’re safe from lightning inside a car because the rubber tires act as insulators. Fact and Fiction. 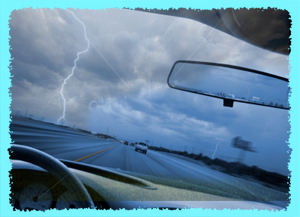 You are safe from lightning in a car if it has a metal top and sides and if the doors and windows are shut tight. Don’t touch the car frame, steering wheel, ignition, gear shift, or radio. The metal shell of the car conducts the electricity away and that protects you, not the tires. 5. Carrying an umbrella can be dangerous when lightning is present. Fact. Anything that makes you taller increases your risk. 6. If lightning only hits the ground close by, you’re safe. Fiction. When lightning hits the ground, the current spreads along the surface to a depth of a few inches. Any fence or pipe in its path will be charged with energy for quite a distance. Any person in its path can be injured. 7. Lightning travels down telephone wires. Fact. If lightning strikes your home, the charge travels through power lines, phone lines, and plumbing until it reaches the ground. If you’re in the bath or shower, touching an electric appliance, or on a corded phone, you could be injured. 8. People struck by lightning are electrified and dangerous to touch. Fiction. People who have been struck by lightning are NOT dangerous to touch. In fact, after people are struck, their hearts or breathing often stop and they must be given first aid immediately.